Millions have been spent by the commodity boards for beef, cotton, pork and milk producers to make sure you know all about their product. They have come up with campaigns that are well known such as “it’s what’s for dinner”, “the fabric of our lives”, “the other white meat”, and you have likely drank milk with or without the famous moustache. These popular ad campaigns as well as additional behind-the-scenes education and research is funded by something called checkoff fees which are usually collected at the point of sale. An example of this is that for every head of cattle sold the beef checkoff collects a dollar. Half goes to the national program and the other fifty cents goes to the state where the cattle was sold. The success of these programs has been noted by horse owners through the country. Although there isn’t a national regulatory body for the equine community that oversees sales and as a result no access to corresponding fees. That is why on the state level there are many horse industry boards being created. In 1998 the North Carolina Horse Council for example gained the right through a referendum to assess fees on sales of horse feed a nickel per bag and two dollars per ton. Although from state to state the horse industry varies greatly. The best way to fund programs is to look locally for organizers and members. 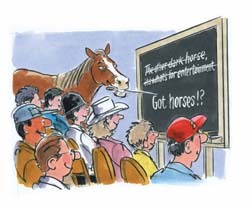 Part of the funding for the horse board in Colorado comes from fees that are collected at each brand inspection which is an activity that the state regulates. In the eastern United States branding isn’t as widespread. Rather it relies on the Coggins test and checkoff dollars are earned on this by the Virginia Horse Industry Board of VHIB at $1.50 each time. The horses owners pocketbook doesn’t received a big dent by tacking on this small fee to each Coggins sample and at the same time this fee can help the board promote the importance of having the test done. Performing a Coggins test helps suppress the incidents of EIA to the point that only three cases were reported last year. No matter how checkoff fees are collected these fees fund programs that are of real value to all horse owners through education, marketing and research which is usually granted on a competitive basis. One is example is grants given to Virginia Tech by the VHIB for research on several topics including equine nutrition. The fact that Vitamin E enhances immunoglobulins in colostrum and as a result passive immunity in foals was determined through vital funding received by the checkoff system in Virginia. The Virginia horse industry focuses their support because of their interest in equine welfare. The first industry-wide study done in two decades was also paid through VHIB sponsorship. An amazing one billion dollars is impacted on the state economy as a result of Old Dominion horses. As a result many legislators have been encouraged to enact horse-friendly laws. North Carolina’s checkoff fees support a variety of adult, youth and 4-H activities and seminars that are targeted to a broad range of horse enthusiasts just like the Virginia system. Both state organizations have seminars several times a year that cover stall and pasture management, safety around horses and general health information. There is even an ongoing need for education even for the long-time horse owners with the newly emerging diseases such as the West Nile virus and equine encephalitis. Even those these checkoff programs can bring in large amounts of money they are also becoming enticing targets. The USDA announced in late 2000 that its referendum results would be terminating the pork checkoff program. An injunction to overturn the decision was filed within weeks by a group that included independent producers, state associations and the national Pork Producers Council. This potential defunct program was then honored later in the month with a national Best of Class for the success they had in promoting “the other white meat”. The most important then to start with is to make sure you have the ability to demonstrate the support of the overall horse industry within your state. Legislators are not surprisingly in support to levy what they consider to be a backdoor tax. A good example to follow is the state of Virginia. The Coggins test was not only a method of assessment, but it was also the criterion for voting on the referendum. Rather than the general public who possibly don’t understand the value of promoting the horse industry, everyone who paid for the Coggins the previous year got a vote. You should also make sure that who benefits from the assessment is made clear. This is important because these are literally the people who are going to support the program. For enthusiasts of all breeds and disciplines these programs can do a lot of good. Consider the North Carolina program which administered over two hundred thousand its first year. Everybody benefits from these types of programs. It is also a good idea to keep in mind that you are not alone. Three state organizations in Texas, Connecticut and Georgia have asked to begin the process within the last month alone. As other states realize that more aggressive promotion is needed for their horse industries there will likely be other to follow soon. Read the next horse nutrition article on Corn: Not a Perfect Grain?